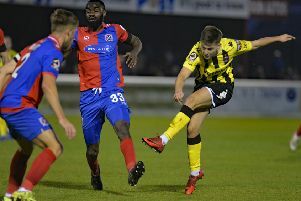 Danny Philliskirk has made quickly made himself at home at AFC Fylde and feels the club is a perfect fit for his style. Released after two seasons at Blackpool, the 27-year-old attacking midfielder has settled a few miles inland, starting all four National League matches to date for the unbeaten Coasters. Phillikskirk said: “As an attacker it’s always great to be playing in a very attacking side. A youth player at Chelsea, Philliskirk enjoyed his most fruitful spell with hometown club Oldham but hopes to fulfil his ambitions at Mill Farm. All that is missing is his first Fylde goal. “The main objective for me is to work hard and enjoy my football. When I can do this, I feel I’m at my best,” he added.